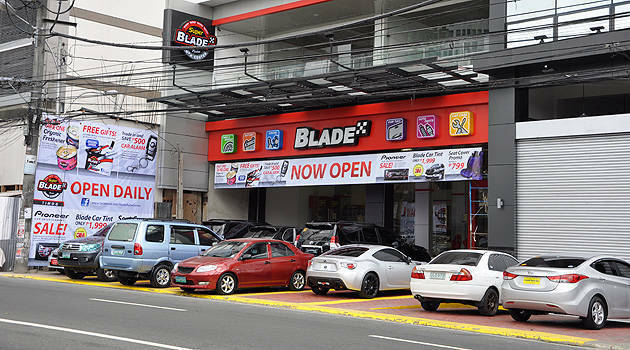 Car-accessory shop Blade has officially opened what it calls its Super Auto Center on Timog Avenue in Quezon City. It is being touted as a one-stop shop for motorists who want "the best products and services at the lowest possible price." 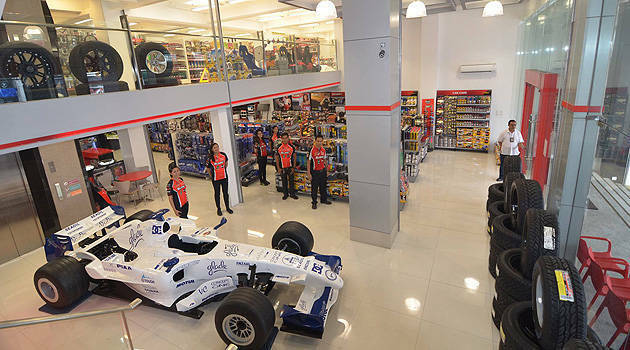 Breaking free from its traditional setup of having its stores in major malls within Metro Manila and Luzon, the Blade Super Auto Center occupies two stories of its own newly constructed, five-story building. On display inside is what it calls "the widest selection of car accessories, auto parts and services in one location." Besides carrying popular aftermarket brands like 3M, Pioneer, Sony, Kenwood, Meguiars, Mothers, Dub, Bosch, Garmin, PIAA and Sparco, it also offers car-care services like aircon cleaning, tint installation, and battery diagnosis. The Blade Super Auto Center also has a customer lounge equipped with Wi-Fi and cable TV to keep the customers entertained, while a CCTV is also available to allow them to view their car while it is being serviced. Food and drinks are also available for the customers. 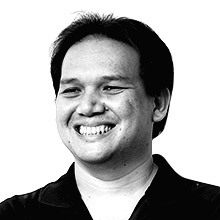 According to Blade Asia CEO Robertson Sy, the secret to the company's success is its offering the kind of products and services a customer expects from a traditional car dealership and service center but at a price that's close to what shops in Banawe charge. With nearly 30 stores now in operation in just nine years, Blade is keen on expanding to other areas in the Philippines in the near future. "It has been an exciting year for Blade," said Sy. "A significant part of our success can be attributed to strong partnerships with industry leaders, aggressive marketing and promotions, and our ability to provide customers with the right products at the right price. From the time we opened our first store at Market! Market! Mall in the Bonifacio Global City, the Blade Auto Center brand has been synonymous with dependability, trustworthiness and great value." Does your BMW have an award-winning engine under the hood?